Home Asp.Net How to create a captcha code in asp.net? How to create a captcha code in asp.net? 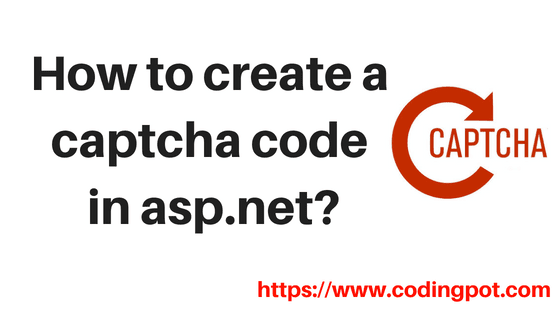 In this Tutorial, we will see “How to create a captcha code in asp.net”. You must have seen that most of all sites have the captcha code in a registration form or another form. Before proceeding this example we should know that “What is Captcha Code?” And “Why we should use Captcha Code?” A Captcha Code Protect your site from Bots. Captcha is abbreviated as “Completely Automated Public Turing test to tell computers and Human Apart”. A CAPTCHA is a type of response test used in computing to determine whether or not the user is human. Why We Should Use Captcha Code? CAPTCHA is mainly used as a security check to ensure only human users can pass through. Computers or bots are not capable of solving a CAPTCHA. Let’s go with the example of CAPTCHA Code, in this example, we will set the captcha code on the Registration page. So we should create a Database and registration table in SQL Server. After created Database and table we will create the project so Open visual studio and create a new empty project with an appropriate name. In this example, we will use the entity framework for creating an example. So, first of all, create 2 new folders (captcha, model). In the model folder we will create Entity Data Model and in the captcha folder, we will create web pages for the web application. Right click on model folder and Add New Item and select Data option from left panel and then in the center panel select ADO.NET Entity Data Model and then click on “Add” button then select Model contents of “EF Designer from database” then select the Data Connection and click on Next button then select the Tables, Views, Stored Procedure which you have created in the SQL Database and then click on Finish button. An Entity Data Model is created, let’s create Registration Web page, Right click on captcha folder and select Add New Item. In the Add New Item Popup Model select the web option from the left panel and then in center panel select the Web Form and give the appropriate name of the page and click on Add button. In the Registration page add the below code for Registration and CAPTCHA code. In this page, we have used Bootstrap CSS file for better User Interface and bootstrap Js file and JQuery file links. You can see in the above code we have used Image control for the generate CAPTCHA code and In the ImageUrl property, we have set “CreateCaptcha.aspx?New=1” because CAPTCHA code Image creates in “CreateCaptcha.aspx” page. So we should to create CreateCaptcha Webpage but in this page, we don’t add any code in the (.aspx) page. In the (.aspx.cs) page we will write the code for generating CAPTCHA code. You can see in above code we have created Image CAPTCHA code and then set the Captcha code in the Session. This Session value we will use for a check that user entered code is same as Captcha code or not. Let’s write the registration code in the code behind of Registration Web page. In the code-behind, we have created submit button click event and check user entered code is a match to Session Captcha code. If the Captcha code is matched then go for Registration otherwise showing the error message on the page. Nice way but this has possibility to get same number in subsequent requests in Captcha. How to create a simple dashboard using AngularJs Material? How to use lodash cdn in AngularJS? How to implement a signalr push notification in Asp.Net? How to upload file in angularjs? Html resizable table in angularjs. How to get image from excel ? How to use UnderscoreJs in angularjs? Hello, my name is Gautam Nagraj. I am one year old blogger.We create and find innovative solution.